When did you decide to specialise in mediation? I came into mediation in 1990 when there was no commercial mediation in the UK, so I was heavily (and very satisfyingly) involved in developing the field here in the UK. Since then it has also been my privilege to act as adviser to numerous governments – Turkey, Russia, Ukraine, Romania, Bulgaria, Slovakia and others – in introducing mediation into their legal systems. Now I work full-time as a commercial mediator, and have done for the last 26 years (before that I was a corporate lawyer in private practice). Mainly my time is spent mediating commercial disputes in the UK and internationally. But during the last 10 or so years, I have also been drawn in to mediating various religious dispute, ethnic and political conflicts, which is deeply challenging but also very engaging and rewarding. I mostly use mediation. Although within that it is important to say that every situation is different and I try to focus on what is most likely to be valuable in a particular context, rather than on using a pre-determined process. For example, I have mediated large-scale religious conflicts where the shape and feel of the mediation process looked very different to how it would look in a commercial context, albeit that the essence of the process was the same. I think it is vital that mediators think in terms of what intervention is most needed and appropriate, rather than seeking to use a pre-determined process which we happen to be comfortable with. How is the current market addressing parties’ needs? In the UK and internationally, the mediation market in which I mostly operate (serious commercial disputes) is pretty sophisticated. Most of the law firms and businesses have a clear idea of what processes are available and which might be appropriate to a given context. And I find that most are also very ready to discuss process questions with me when I am the mediator. The main areas for improvement relate to mediators. It is hard for new mediators to become involved, and clients are understandably reluctant to use less experienced mediators. But if the field is to grow and acquire greater sustainability, systematic ways will have to be found to encourage and develop new mediators. Organisations like the International Mediation Institute (IMI) play a part in that, and as an individual I always try to mentor one or two younger (in experience or years!) mediators at any given time. Do you think there is a need for more data in dispute resolution? Yes, data is vital. The whole mediation industry is essentially somewhat “secret”. Mediations take place in private, and rightly so because the parties value their privacy. But the flipside of that is that little is really known not only about the levels of uptake but also about what actually takes place within mediation. The challenge is to make this kind of information available without compromising confidentiality. Again, doing so will likely contribute to the long-term credibility of the field. The final data from the Global Pound Series will I am sure be fascinating, and will hopefully contribute to all our understanding of how to develop the field. I see some obvious scope for growth in the on-line dispute resolution field, and in fact more such platforms are emerging all the time. For example the new proposed reforms to the Scottish court system envisage an on-line bling bidding platform for parties to explore settlement options. These systems will only grow in sophistication. I would expect them to find considerable usage in high-volume, low-value claims. My hope, however, is that we do not lose sight of the essential dynamic of face-to-face human interaction which is so integral to the mediation process, and often so necessary a part of achieving resolution. Indeed some would argue that already the obsession with social media has begun to impact on the capacity of people to form healthy face to face relationships, in which case human contact in dispute resolution will arguably become all the more important. How could cross-border disputes processes be better streamlined? It is a truism that the world is getting smaller as communication systems improve, and yet despite that different cultures still express and address conflict in very different ways. These differences are often acutely visible in international mediations, where the expectations which parties have of the process, the other parties and the mediator can differ greatly. Indeed, this is one of the challenging but rewarding aspects of mediating internationally. Addressing it is not easy, but it is certainly helped by mediators and mediation users meeting regularly to discuss what we do and how we do it. I find these some of the most enriching encounters I have. Overall, however, the biggest need is to build international confidence in the mediation process and in mediators. This is partly the result of slow organic growth, which often results in an emphasis on quality more than quantity (and this needs to be valued, despite the frustrations it can cause to those wanting to become mediators!). But it also points to the need for systems which legitimise the process and bring confidence to users – for example, credentialing – provided they operate in a “light-touch” and relatively un-intrusive fashion. Much of my work as a mediator involves international/cross-border disputes – not least because London (where I am based) is such an international business and financial centre). So I know first-hand the challenges parties may face when seeking to appoint a mediator in an international dispute, and their desire for systems that provide comfort. That said, the system cannot be that bad, because in the last week alone I have had three non-UK commercial mediations referred to me! Formerly a corporate lawyer, Bill has mediated full-time since 1991 in a wide range of disputes and conflicts involving national governments, businesses, professional firms, pressure groups and individuals from over 50 countries, and across almost every area of law and business, as well as in religious, ethnic and political conflicts. He has served as adviser on mediation/conflict resolution to various governments and public institutions, and trains and mentors mediators from around the world. 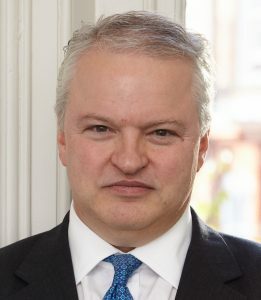 He serves as Special Adviser on Reconciliation to the Archbishop of Canterbury, as well as being on the Advisory Board of the All Party Parliamentary Group on Conflict Issues in the UK Parliament.